PHP base, and uses MySQL database and HTML components. At Ace eComm, we provide our ecommerce clients with top quality and prompt Zen Cart Product Data Entry Services. Our experts are adept at uploading products on Zen Cart using both spreadsheet and manual data entry accessing Zen Cart backend. Our professionals are thoroughly skilled with all the intricacies and complexities of Zen Cart Catalog Management Services. With rigorous experience our team is able to uplift your ecommerce business, and we are confident that our unparalleled services will exceed all your expectations. Before we take off with our partnership, our primary step is to have a detailed discussion with you and know your business requirements and goals in totality. Our experts are capable of gathering product information from an array of sources such as hard copy catalogs, digital catalogs, supplier’s website, scanned images, PDF files. We have the ability to enhance and enrich your Zen Cart store to attract a pool of online visitors and convert them into happy customers. We can proficiently handle the entire Zen Cart Data Entry tasks such as data collection, data formation, data analysing, product description, product classification, image modification etc, in CSV format. We assign your products under specific categories and subcategories so that customers are able to locate your products with ease. Our experts can accurately enter crucial product information like title, description, model, SKU, brand name, UPC, images, prices etc into the Zen Cart product database and spreadsheet. We create critical product attributes such as colour, shape, model no., dimension, style etc to define them in a wholesome manner. For a better visual appearance, our skilled Image Editors will add suitable images to compliment the product even further. If needed, they can also create, enhance, edit, resize and crop product images. Our accomplished writers will pen down unique and SEO rich product description to inform the customers about the product. We also help in creating product meta titles and meta tags that are rich in keywords. This would ensure better search engine rankings. 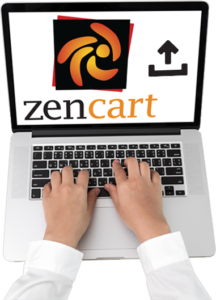 We also provide Zen Cart Bulk Product Upload Services. Our experts make use of sophisticated bulk listing softwares and CSV files to upload large number of products in a timely fashion. We can research your competitor’s websites to perform a price comparison. This way you can offer the best prices to your customers and stay ahead of the competition. We’ll assist you with order processing and order tracking to ensure a hassle-free delivery process. We’ll also help you inventory management by making sure we examine the product’s availability so that your customers are not exposed to any misinformation.